The new year offers a fresh start, it’s only natural to want to get organized for the year ahead. 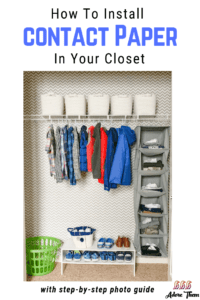 When I looked around our home for areas in need of organization, my youngest son’s closet was high on the list. It was a disorderly mess with bins of collected school work and keepsakes that were overflowing and didn’t belong. 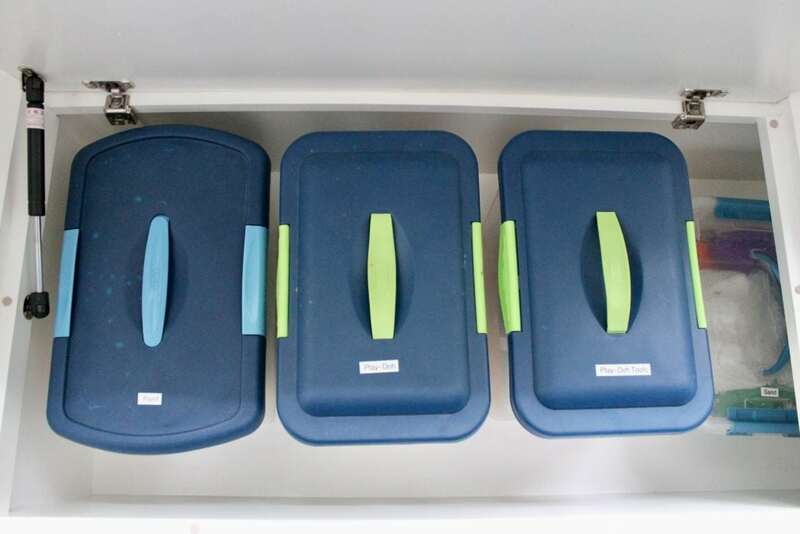 After they were sorted through and removed, this left his closet full of possibilities…. As the New Year approaches it’s a great time to set goals and get organized. 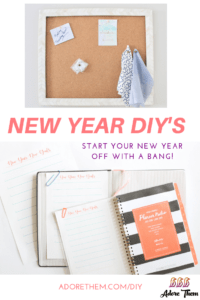 Here are two simple ways and a DIY to help you start your New Year off with a bang! 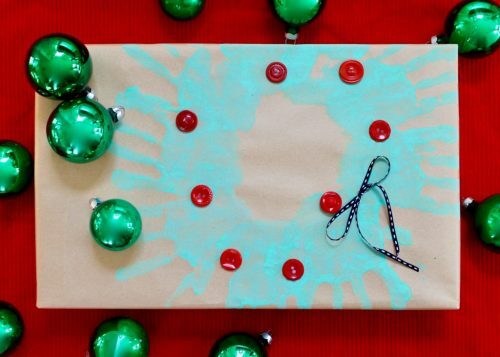 5 DIY Gift Wrapping Ideas for Kids! 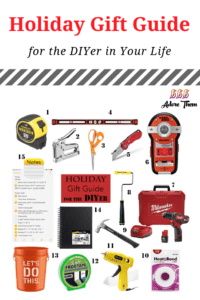 Looking for unique ways to involve your kids with gift giving this holiday season? Have them help wrap presents! 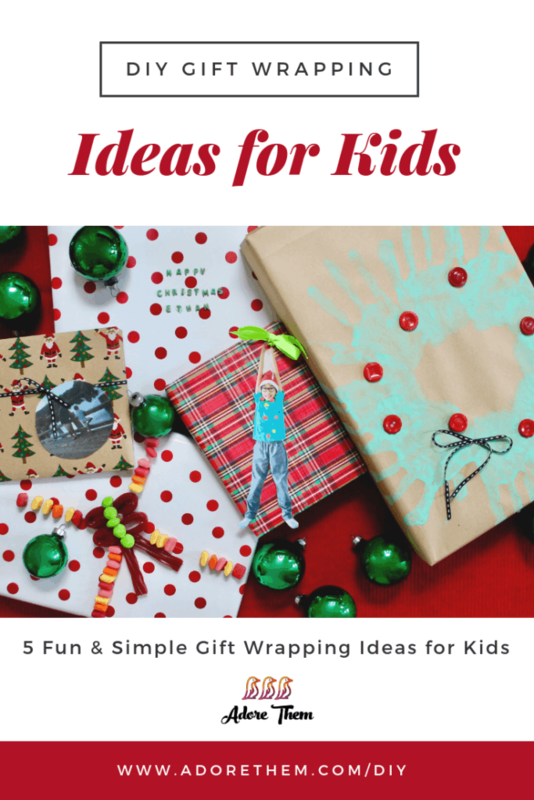 Here are five DIY gift wrapping ideas your kids will have fun creating and your recipients are sure to love! First remember that with any project involving kids, the end result will be messy! The memories you make when you create and give are what’s important. 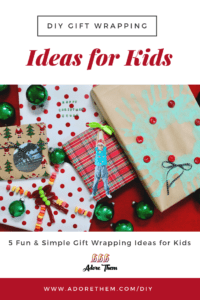 That being said, with my guidance, my children made all five wrapping ideas below! Who doesn’t love a sweet treat with their gift? 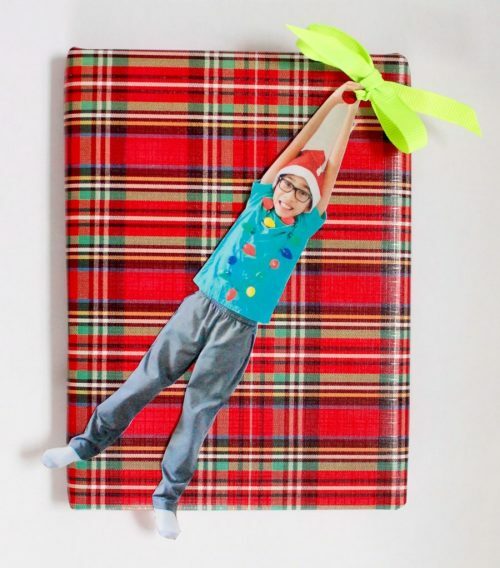 Kids are sure to love making and receiving this special present. Simply choose a favorite candy, gummy or candies with a hole work best, and thread with jewelry string. This works great for a candy ribbon that can be eaten when received! 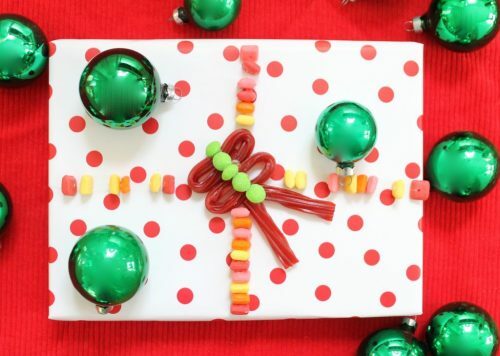 For a non edible bow use hot glue to hold the candy in place. Spell out your holiday greeting with painted alphabet pasta! Hot glue the letters onto the gift when you’re done. This is so simple and the possibilities are endless, it’s educational and fun! My kids made these years ago and it’s so cute that I brought them back this year! I especially love to use these when gifting a book. I like to have them wear holiday attire, Christmas jammies would be adorable, then take a photo. They can be jumping for joy, something that stretches their body in all directions makes it more fun. Print the photo on preferred paper and have your child write who it’s to and their name along with the date on the back. Use laminate sheets to cover the front and back, then cut out just the body, no background. 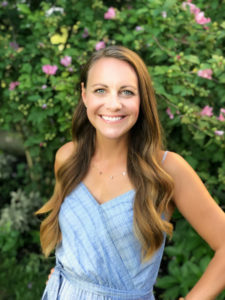 I like when my kids have their hands clasped above their head, I can use a hole punch to place a ribbon through and it looks like they are holding the ribbon. Wrap the gift and use the bookmark as a name tag and the ribbon as a bow! Print a photo of them with the recipient. It can be on photo paper, card stock, or printer paper. Have your child write who it’s to, their name, and date on the back. Laminate using the same self adhesive sheets as above. 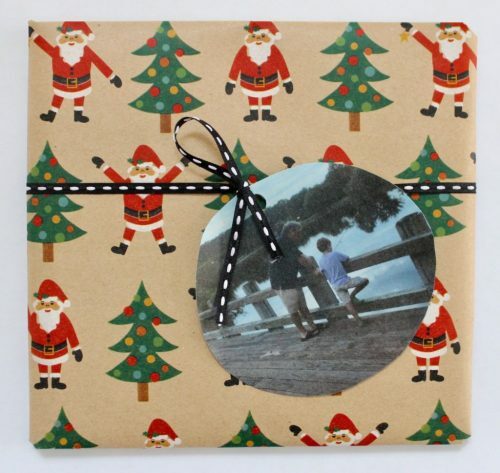 Cut out in a circle or decorative shape, hole punch and string ribbon. The photo can become an ornament and decorate next years Christmas tree! 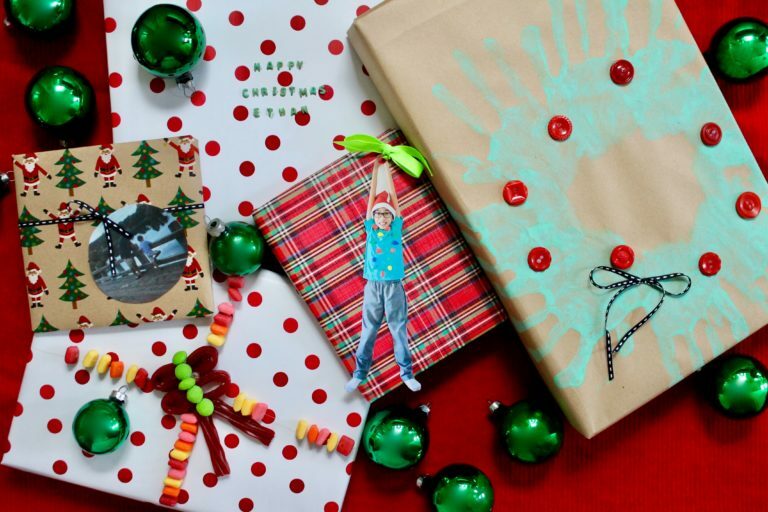 Having your kids make wrapping paper is so easy and fun. Start with white or brown craft paper cut large enough to wrap your package. Decide on a design or let your kids create their own. Use markers, crayons, or paint! For this gift we made a wreath out of hand prints, buttons for ornaments, and a ribbon for the bow! 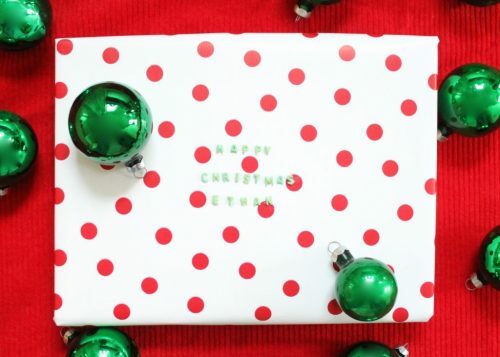 I hope this inspires you to give creatively this season! Remembering to take care of yourself first is a task many moms don’t take seriously. But, the truth is, that you can not pour from an empty cup. 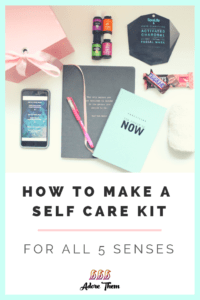 During this hectic season of life, I’ve not only been proactive in taking me time, I’ve ensured I have everything I need by creating a Self Care Kit filled with the essentials to reset my battery during a busy day. 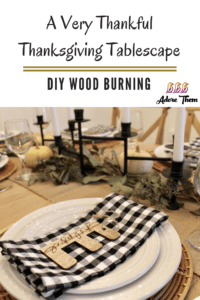 Wood burning, decorating wood with a tool that creates burn marks, is just like writing or drawing. It’s very easy and just a bit tedious. 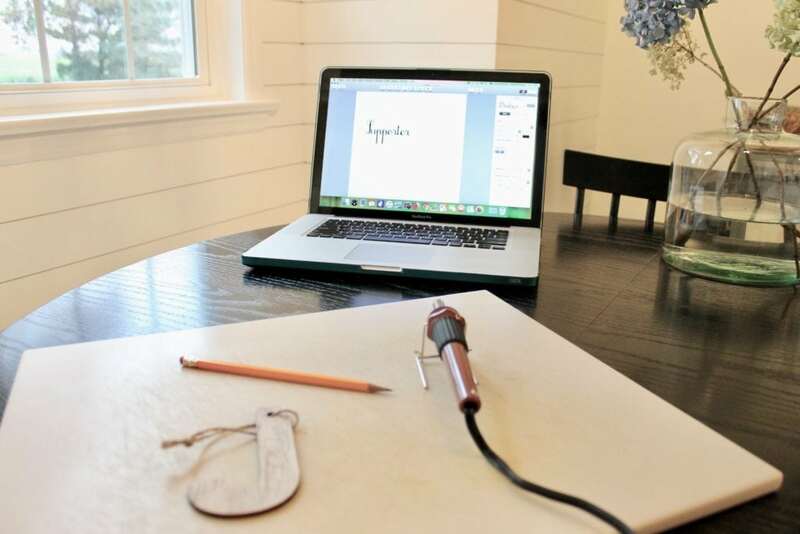 Simply sketch a drawing or word in pencil onto the wood and trace over with your wood burning tool. The pen like tool burns the wood to create a design. For this project, use wooden letters found at a craft store. The letters for this DIY were purchased at Target dollar spot. The twine loop allows this craft to be reused yearly on a thankful tree or a Christmas tree later in the season. 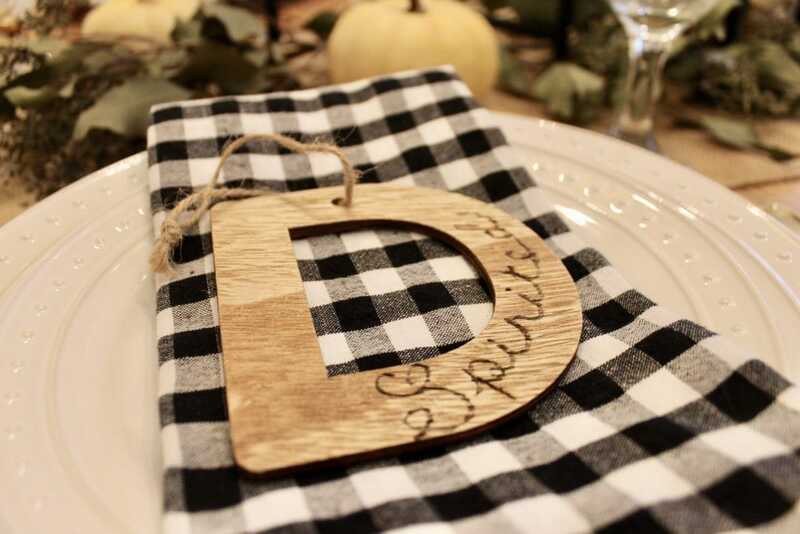 The wooden letter is the first initial of each person attending our Thanksgiving and will be used as a name tag on their place setting. Make this a family activity by asking your children to help decide the word that will be burned into the initial. It’s best to use only word of why they are thankful for that person, help them along if needed. Type the word into a document and try different fonts. Once a font has been chosen use it as a guide to free hand the word with a pencil onto your wooden letter. Or print the word out and create a stencil. 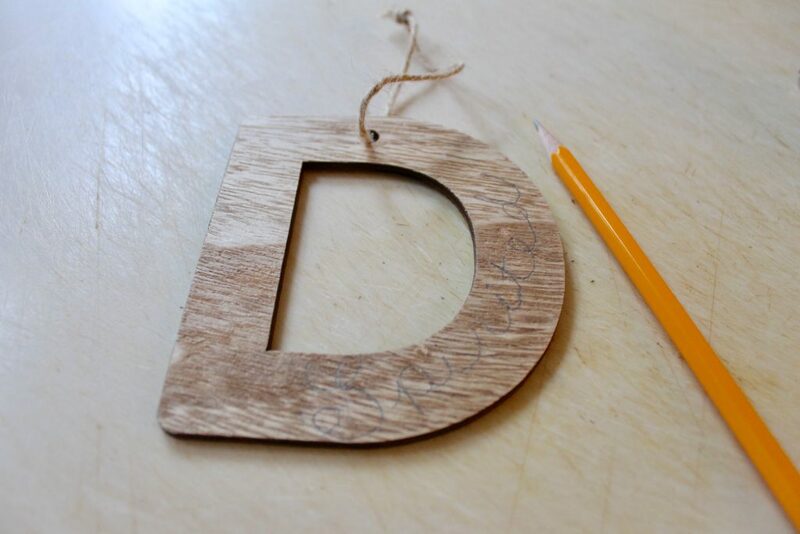 Then simply pencil trace onto the wooden letter. 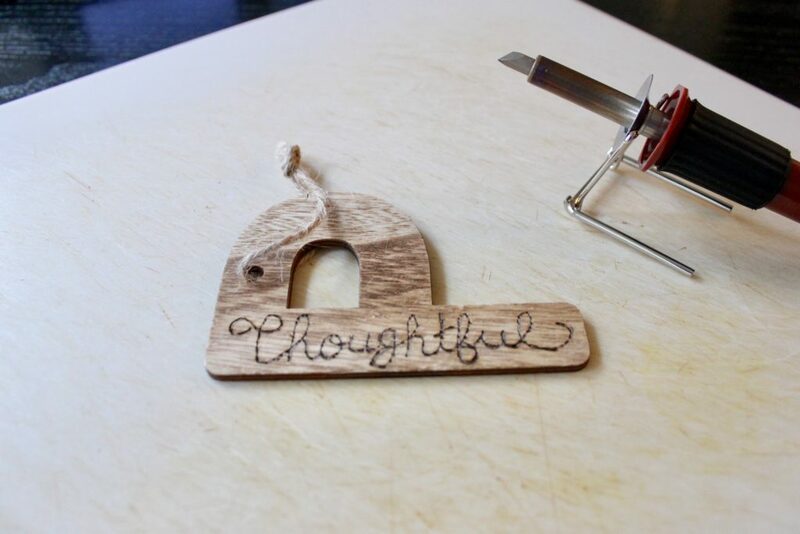 Once the penciled word is as desired, on a glass surface or work board, heat the wood burning tool to the preferred temperature (wood is usually the highest setting) and trace over your pencil drawing. After you’ve burnt your word into the wooden letter, erase any pencil marks still visible on the wooden letter. Complete the above steps for each letter. 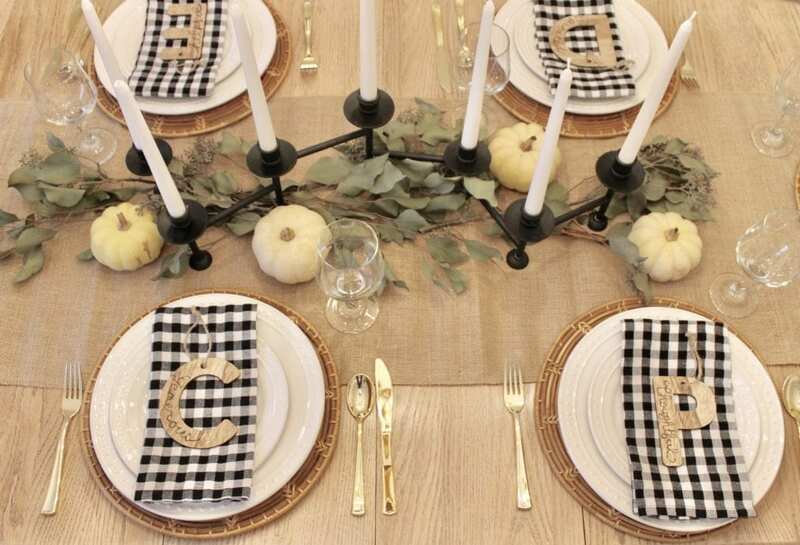 When setting your Thanksgiving table, layer your charger, dinner plate, salad plate, napkin, and finally your wooden letter as a name tag for each place setting. 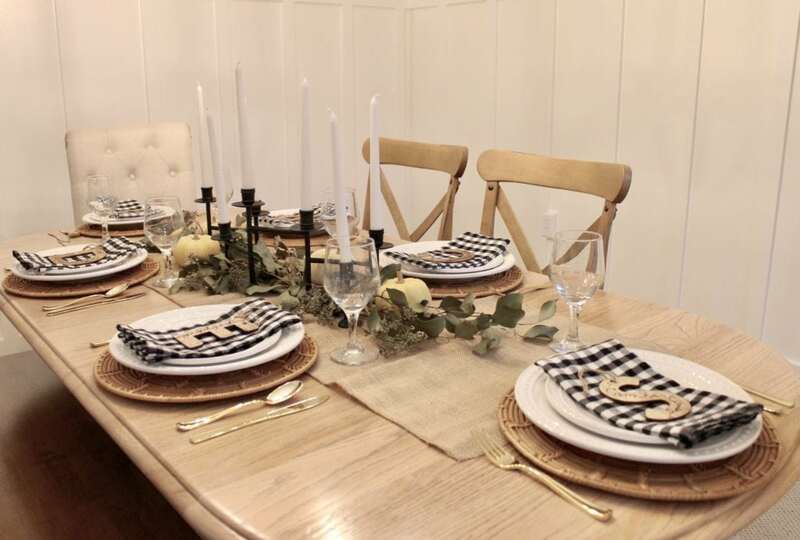 Guests will be delighted to read the words that your children used to describe why they are thankful for them. 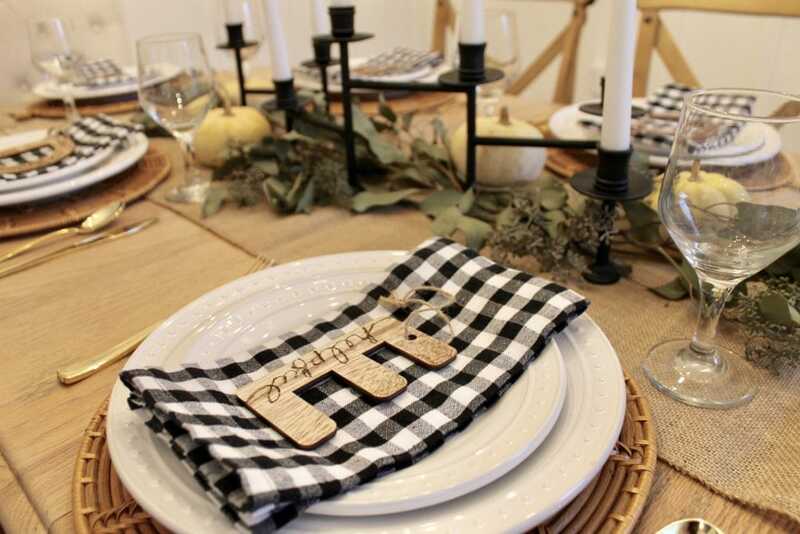 Not only will it be a conversation starter at your Thanksgiving table, but your guests will have a memento to remember the day. 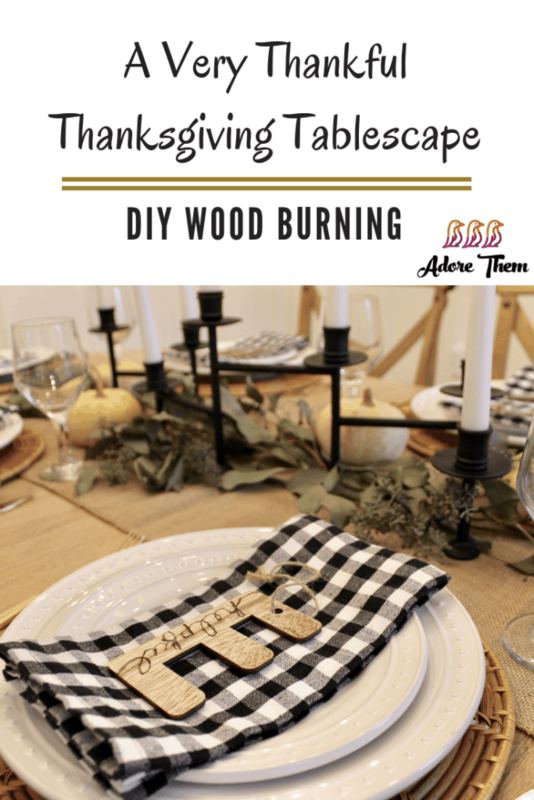 If wood burning isn’t a DIY you’d like to try, simply write the thankful word on each wooden letter in marker or paint. Kids can sign the back and add the year to make it a keepsake your guest will treasure. When I came across this saying as I was scrolling through Instagram I thought this is so true. 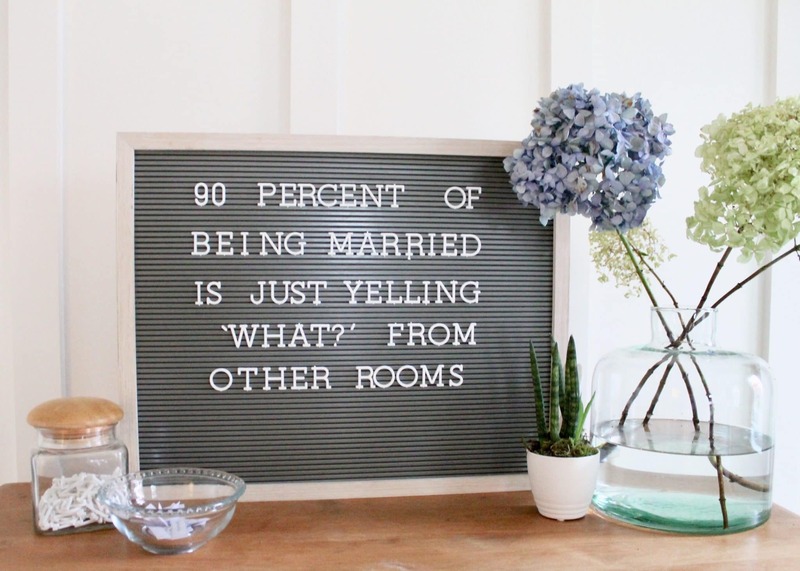 After 13 years of marriage I had the greatest gift of being able to spend my life with my best friend, but we weren’t spending as much time together as we hoped. He’d be playing with the kids as I was making dinner. I’d be helping with homework and he’d be fixing a leaky faucet. At the end of the day we’d get ready for bed and realize we hadn’t really spent any quality time together. This past year my husband gave me the greatest gift. It’s the easiest DIY that I didn’t even do. 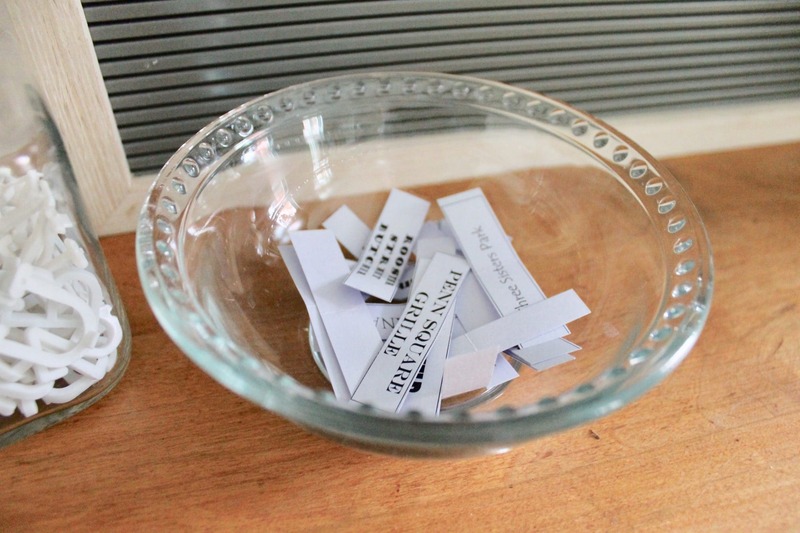 In that little glass bowl are names of different restaurants in the area. Nothing fancy, he just printed names of restaurants we had never tried in the area from the computer. At the beginning of each month I get to reach in and pull one out. He sets the day, makes a reservation if needed, and gets the sitter ready for our date. Because, after 13 years of marriage we realized we needed to date each other again. The restaurants range from burger joints to fancy sit down meals. Sometimes life gets busy and we decide to date night with friends or skip going out and opt for a movie night at home. 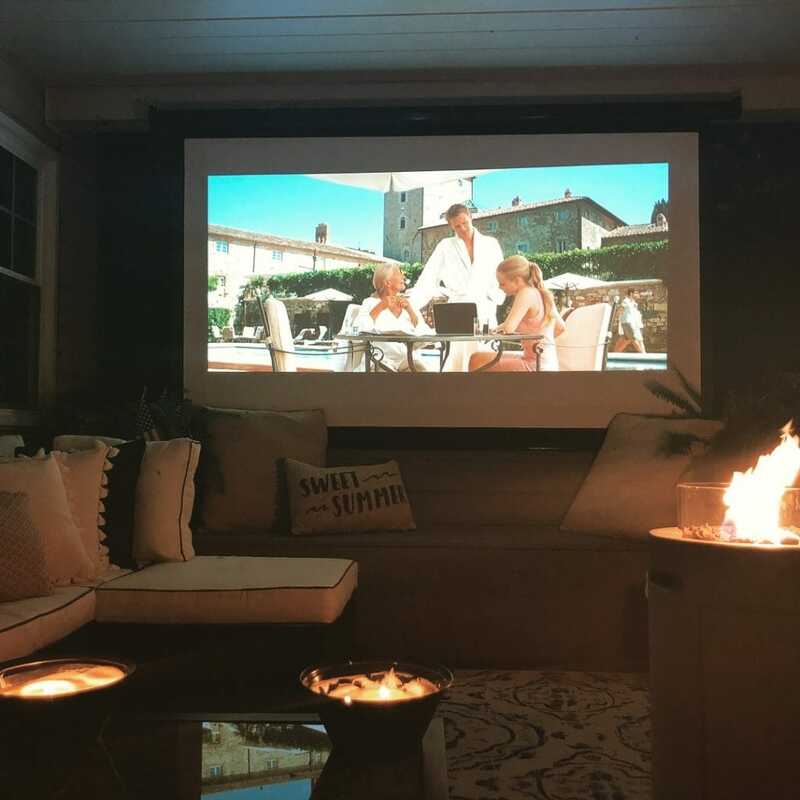 We especially love to put the kids to bed and watch our movies on the deck. Date nights can be almost anywhere or anything. Game nights, movie nights, fancy dinners, or a walk in the park during your lunch break. 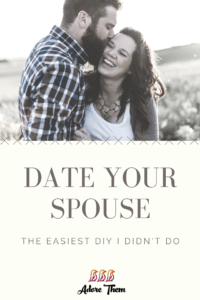 You can’t give your marriage a greater gift than the time spent together. 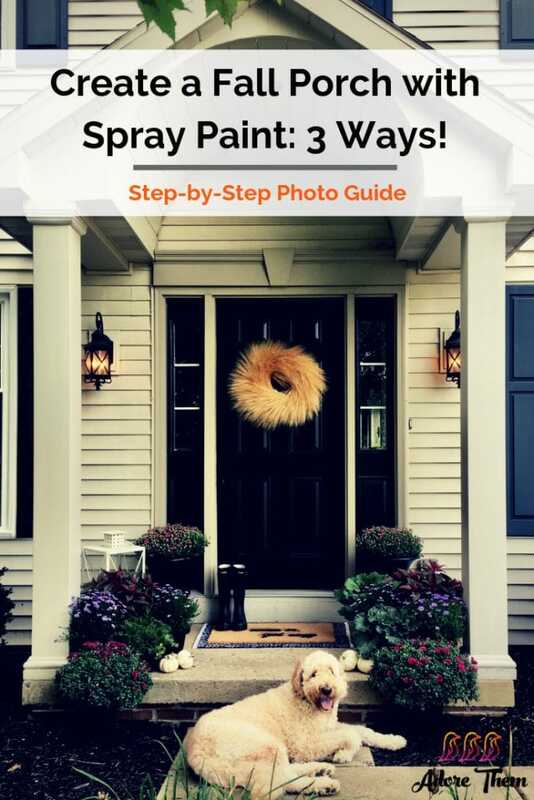 Create a Fall Porch with Spray Paint: Three Ways! First clear the cobwebs. Hose off your porch to start with a clean slate. Double the rug, using two rugs gives your entry a fun twist and enlarges your space. 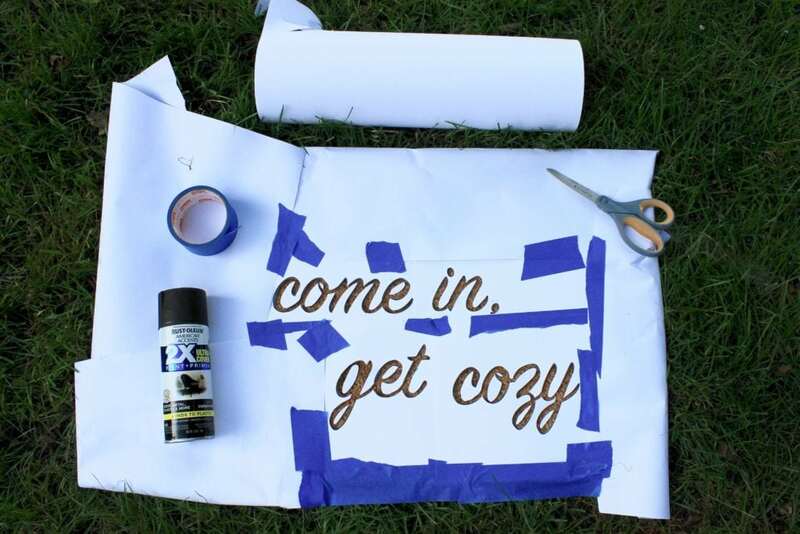 Spray paint a coir rug with a stencil giving visitors a friendly welcome, haunting note, or silly saying. 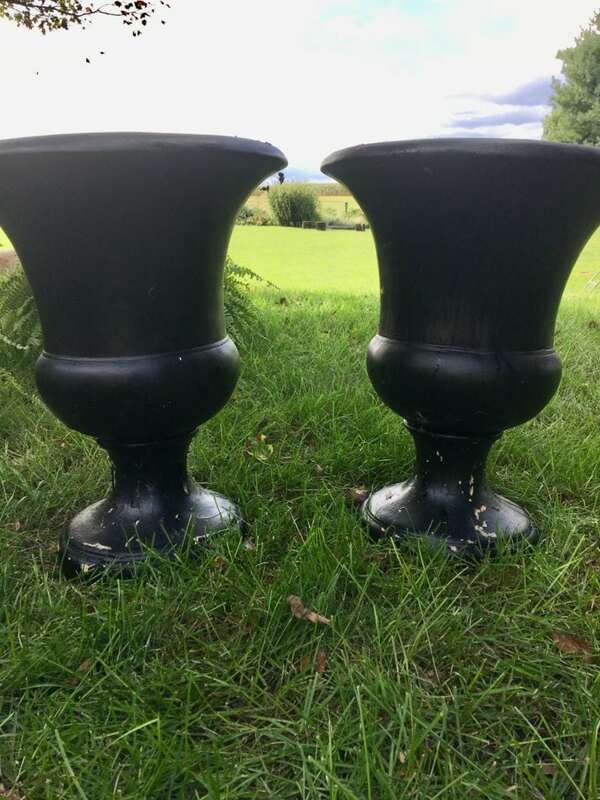 Spray paint weathered planters to give them new life. 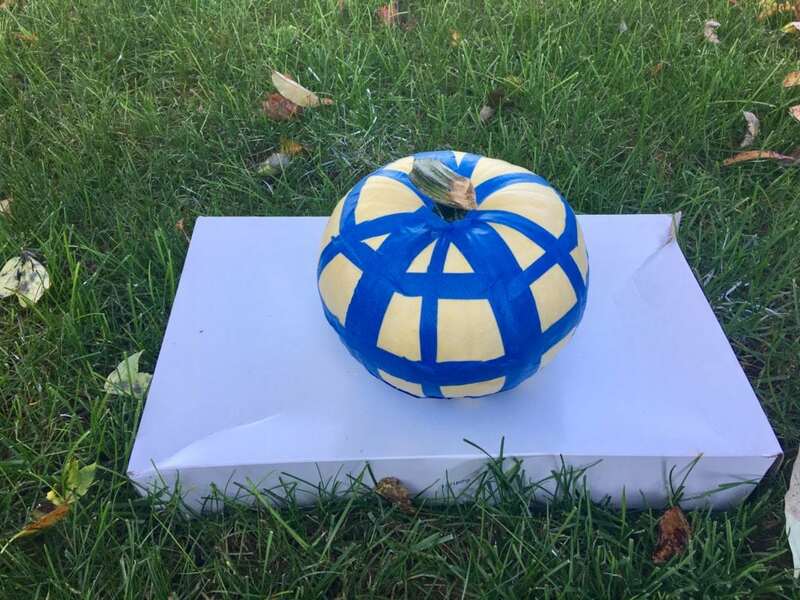 Spray paint pumpkins using painters tape or drill holes to create lanterns. 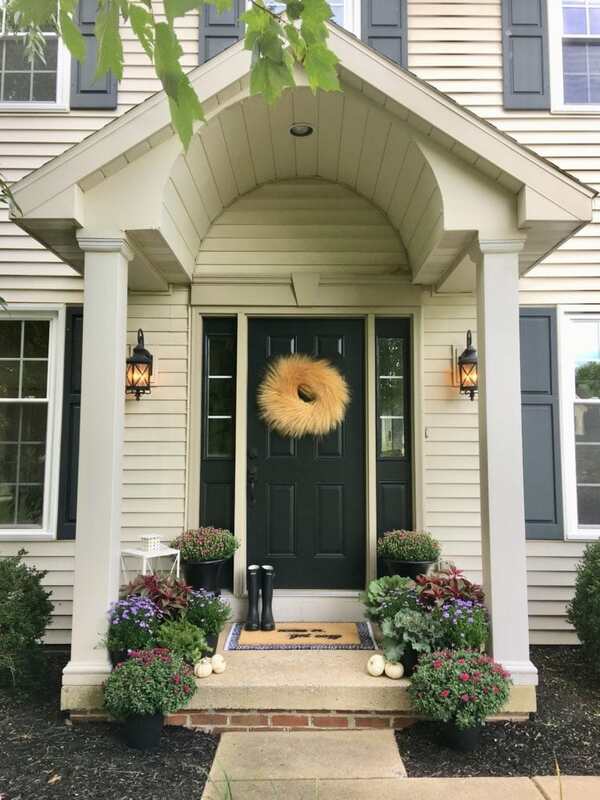 Finally, add a wreath and mums to give your space a fresh new look. Spray paint your own doormat. I love the look of a fresh entry. 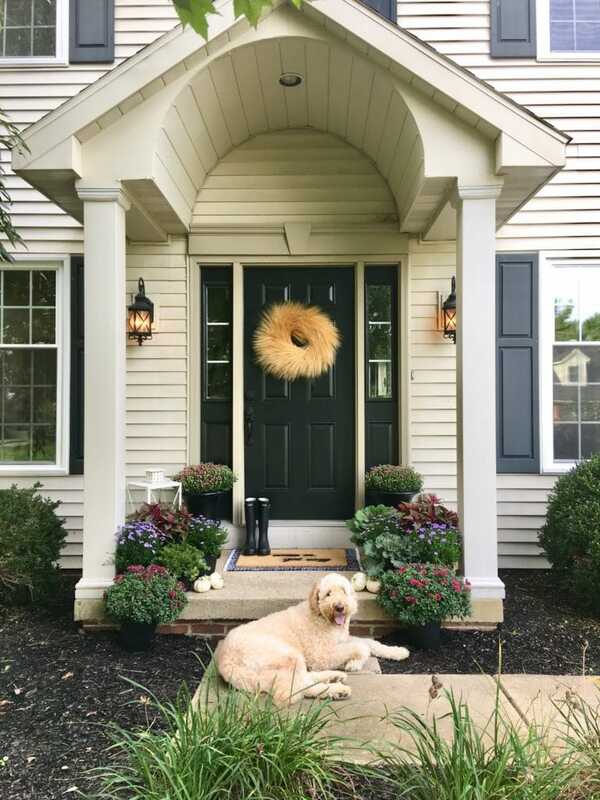 Adding seasonal plants, a chair and pillow, lantern or a new doormat welcomes each visitor who enters. However, changing your doormat out each season can be costly. 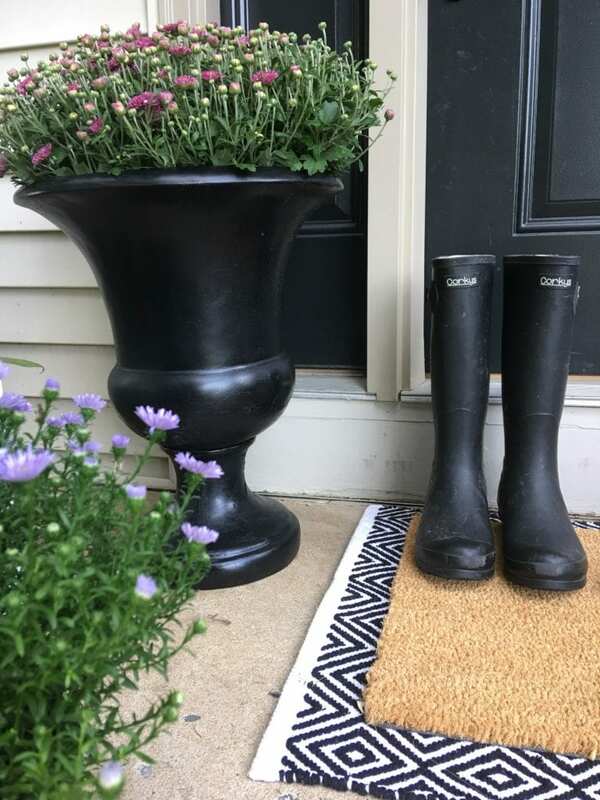 Here is an easy DIY to make your doormat look fun while being affordable. 1. 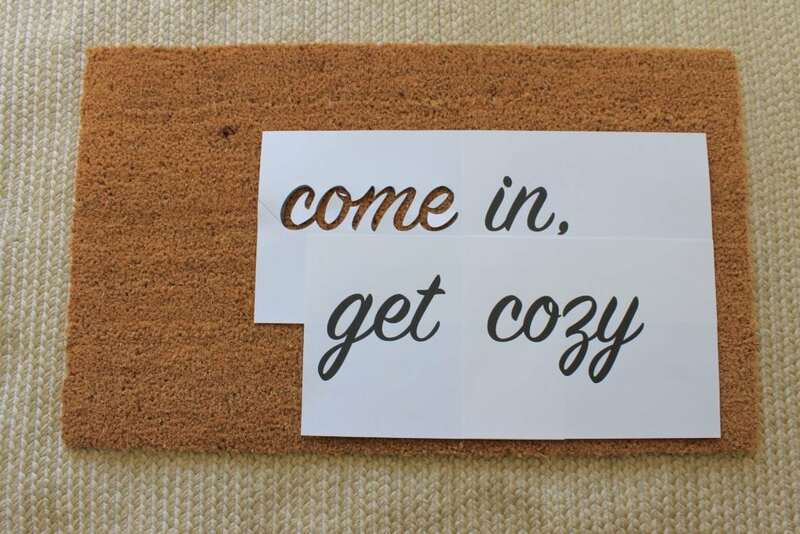 Purchase a plain coir doormat and a can of spray paint in any color. 2. Choose a note for your mat. 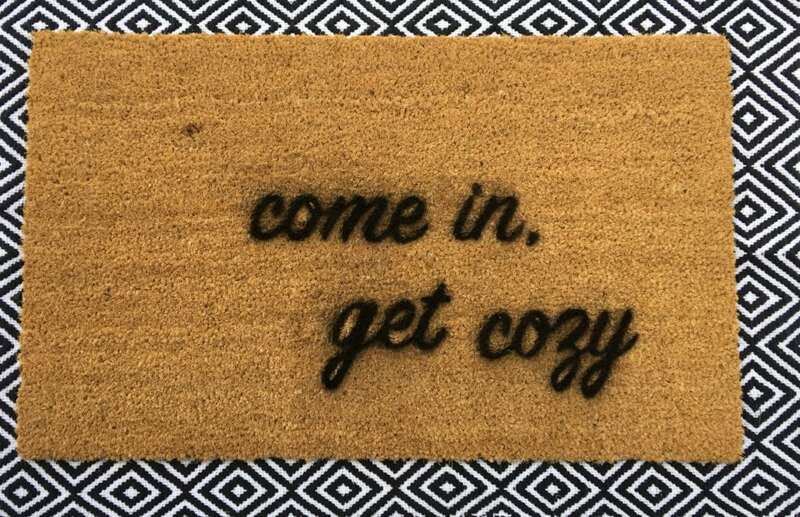 For this project ”come in, get cozy” felt welcoming for fall. 3. 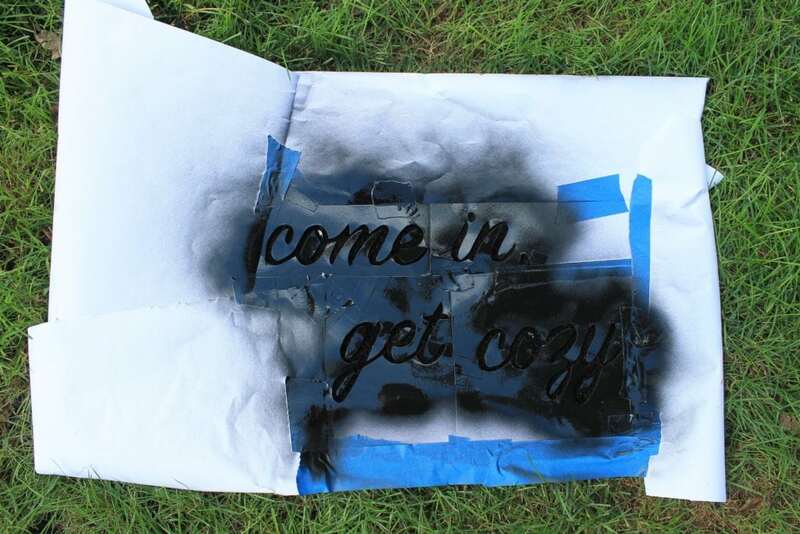 The least expensive and easiest way to create a stencil for the next step is to print your saying on regular card stock. This will become your stencil so plan out the size of your letters. Choose your font then make the text size as large as possible while fitting on the page, ensuring that each word has it’s own piece of card stock. 4. Cut out each word being sure to enter and exit at the same point. Also, carefully remove the loops inside of letters. 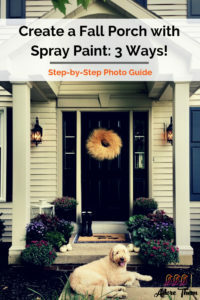 Place tape over the entry/exit so that no spray paint will seep through the gap in paper. 5. Position each stencil on the coir mat using painters tape to secure. If the paper gaps, secure it with wrapped painters tape just inside the stenciled letters. 6. Now, lay each of the small pieces that make up the loops of words. You’ll need to wrap your painters tape so it’s sticky on both sides. 7. Use butcher paper, newspaper or anything large enough on hand to wrap around the coir mat and secure with painters tape so there is no over-spray. 8. Making sure that only the cut out stencil is showing on your mat, spray light even strokes over your words. Once the paint looks even, let set for a few moments. 9. Remove all paper and tape from your mat. 10. 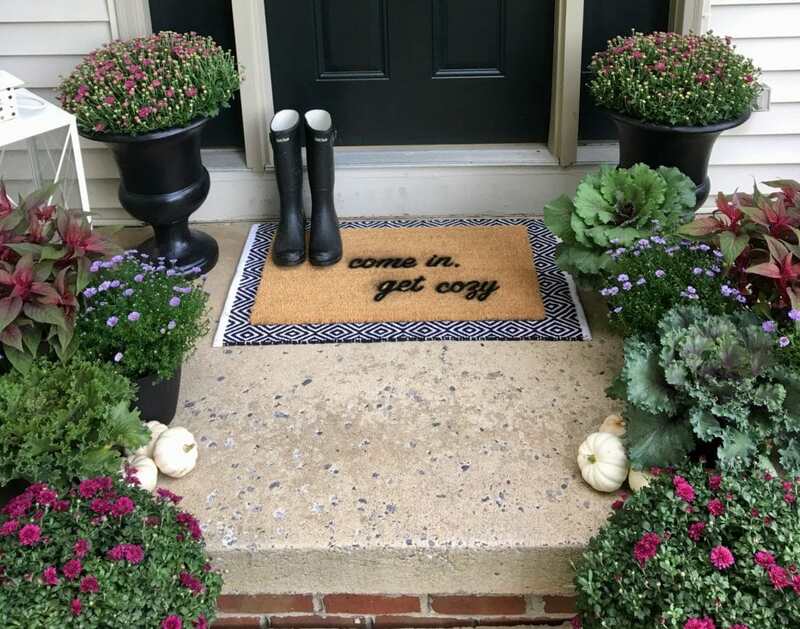 Layer your finished coir doormat over another outdoor mat to make it appear larger. 2. Spray paint flower urns, pots, baskets or pails. After each season take some time to look over flower containers. Discard broken pieces. For items that have lost their luster, consider freshening up with spray paint. Before painting, give each item a good clean and a light sanding for the paint to adhere properly. Coat in light even strokes until each item looks new! 3. 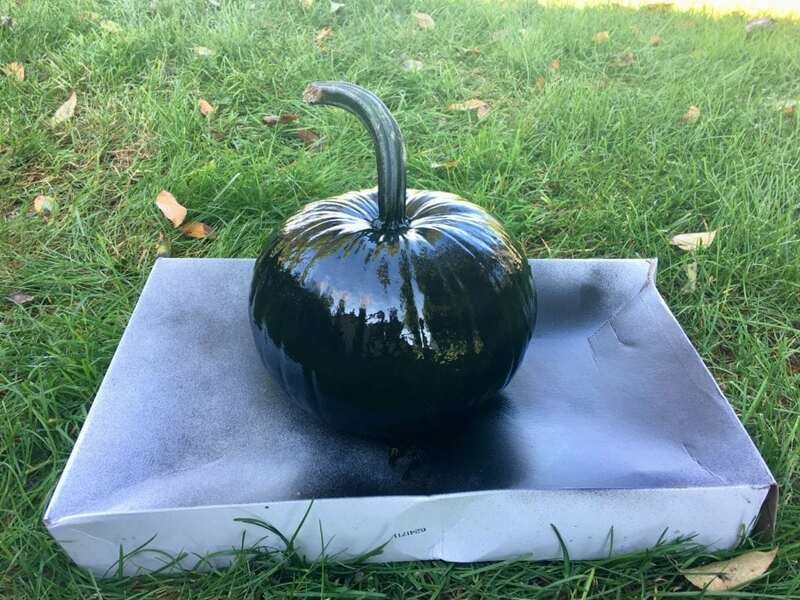 Decorate pumpkins with spray paint. In the early fall season I prefer to decorate my pumpkins without carving so that they last as long as possible. So adding a touch of color is easy with a little spray paint. To make this fall porch cohesive and to save money, I stuck with the same can of black spray paint. Add a fun design with painters tape making a pattern or use a stencil to spray on your house numbers. 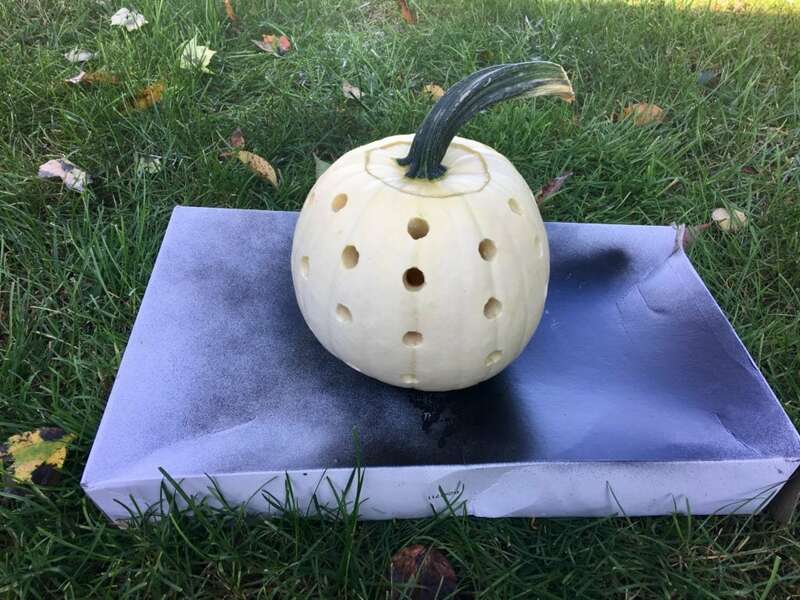 When it comes time to carve, use your drill and make your pumpkin into a lantern to light your porch and welcome even the furriest of visitors! 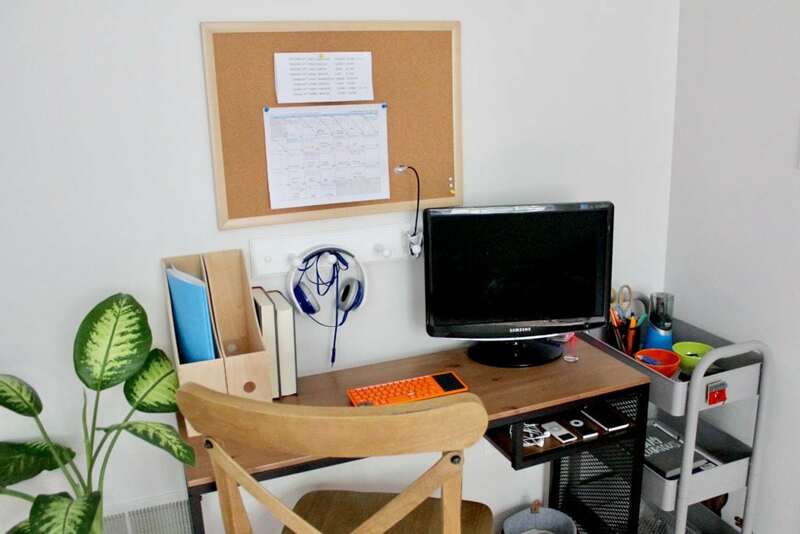 Teens spend a great deal of their time in their room and at their desk. 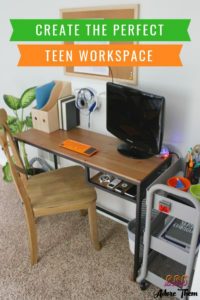 Set your teen’s workspace up for success with just a few simple steps. 1. Start with a desk that your teen will feel comfortable working at. 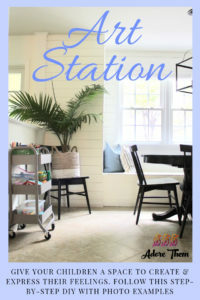 Choose a desk that doesn’t offer too much room for items to get lost or pile up, but just enough room to have a few essentials and space to work. 2. A good supportive chair. A variety of office chairs are available in every color, plushness, with armrests, and wheels! But, don’t overlook kitchen chairs or even stools. Stools are ideal for teens who stand and move around when they work. 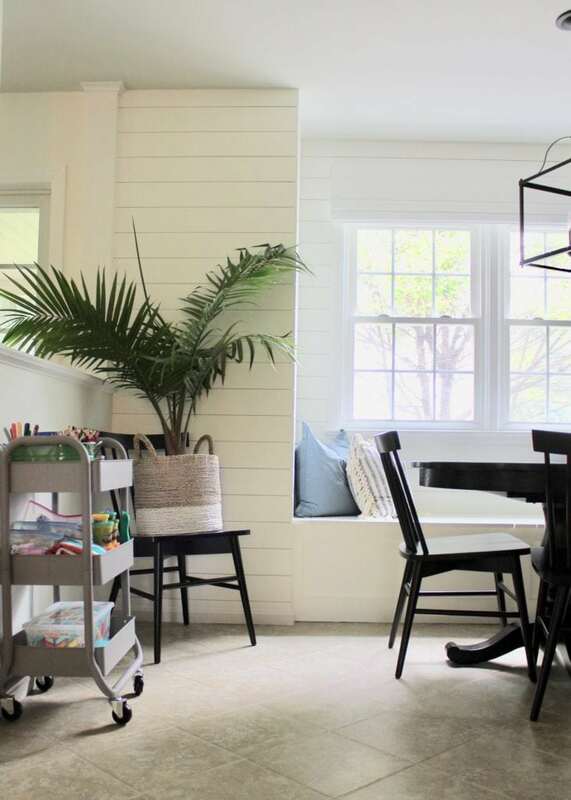 Kitchen chairs add comfort but don’t encourage lingering at the desk for too long. Add a lumbar pillow for back support when needed. 3. Organize calendar and activity schedules on a cork board but leave plenty of room for additional papers that come home for projects that are due. If the calendar is electronic such as Google Calendar, simply print the calendar at the beginning of each month to help stay on task. 4. Use a hook rail to hang headphones, scissors, or to clip on a good LED study light so it doesn’t take up valuable work space. 5. Organize folders with an in and out file system. What still needs to be worked on kept on one side while what is finished kept in the other. 6. 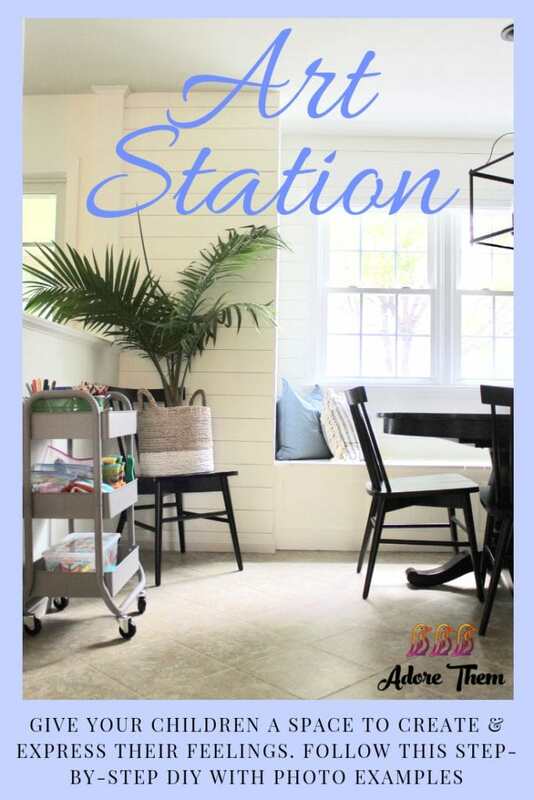 Incorporating an electronic station is key when it comes to teens. This desk has a great shelf for electronics. 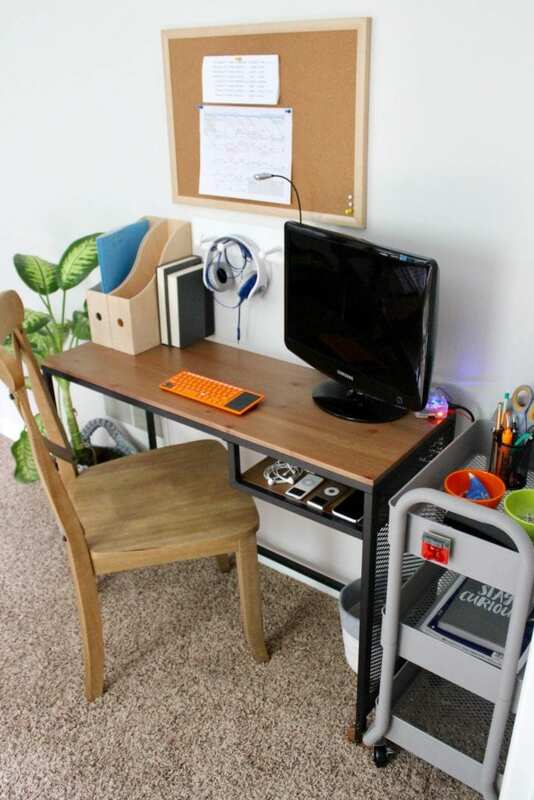 Attach a surge protector to the desk using velcro on the back of the strip and the desk shelf. Cords can be kept out of sight using a reusable velcro wrap tie. Invest in a power surge protector that has USB ports and regular outlets. 7. 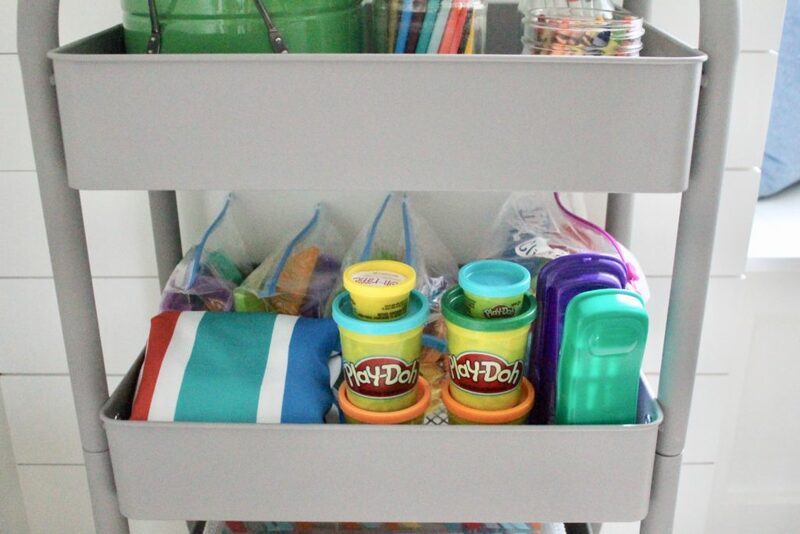 Add a rolling cart to contain the clutter. On the top tier most needed items are easily accessible. 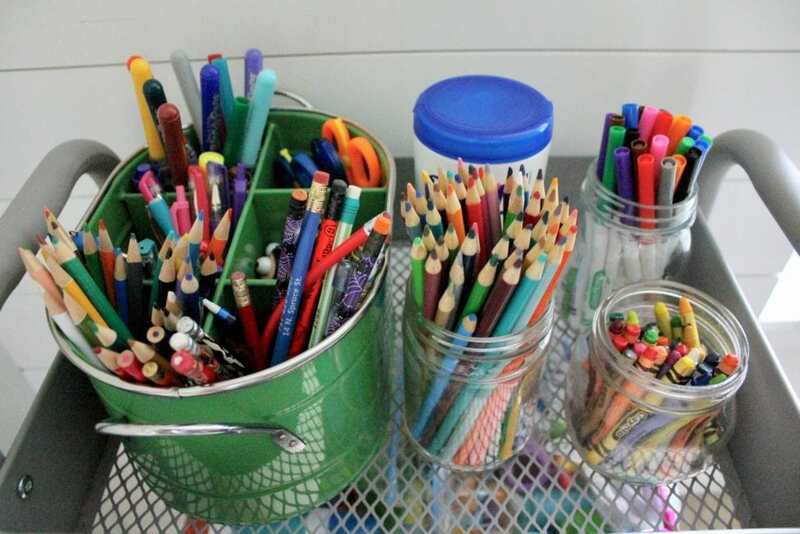 Pens, pencils, highlighter, sharpie, and scissors are all kept in a colander while two colorful bowls hold paperclips, binder clips, rubber bands, white out and staples. 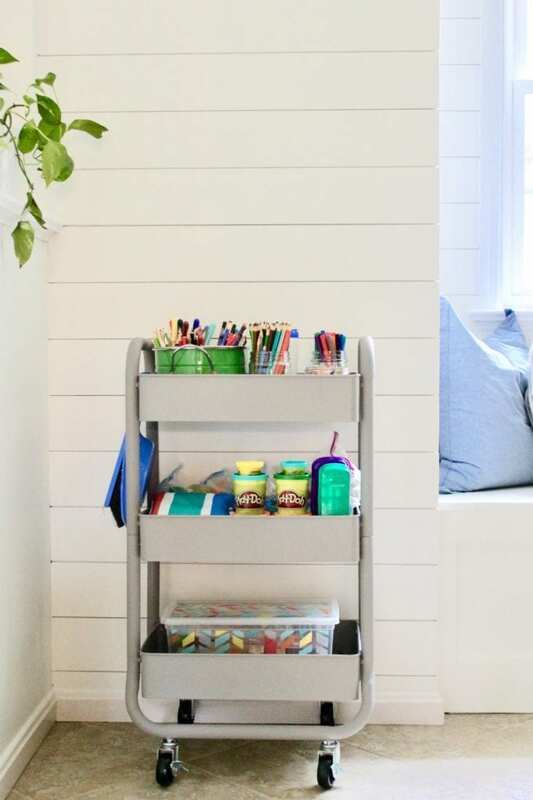 Add a stapler and an electronic pencil sharper so your teen has everything they need to get to work. The second tier is for paper and folders, while the bottom tier is intentionally left empty to be used however your teen needs. 8. Don’t forget to add a small basket for trash. 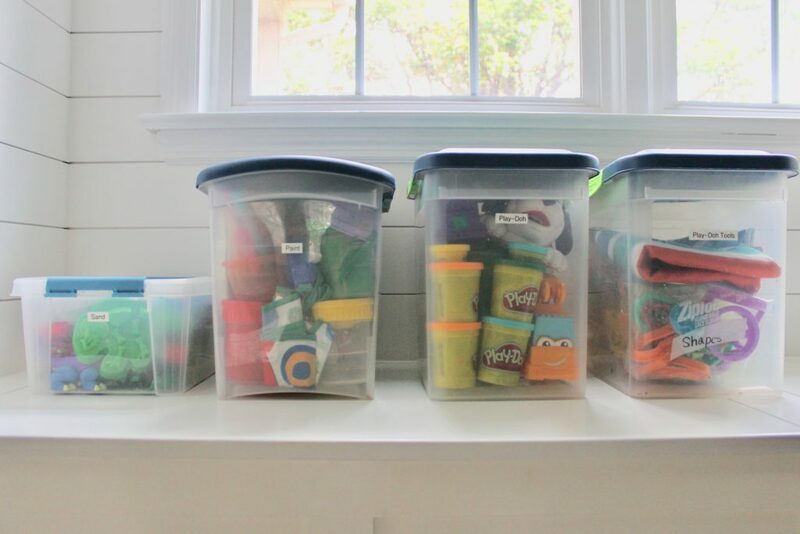 Your teen will be organized and ready to conquer any task big or small!